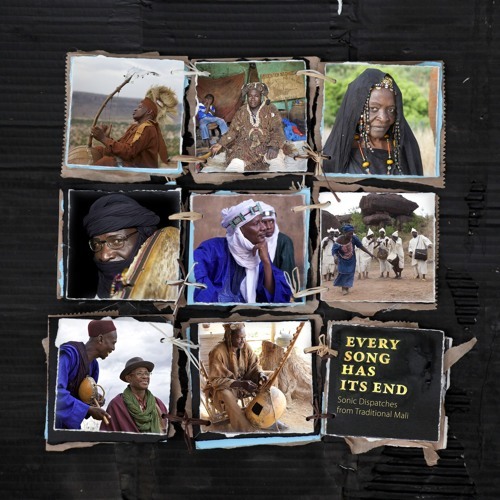 VARIOUS ARTISTS EVERY SONG HAS ITS END: SONIC DISPATCHES FROM TRADITIONAL MALI Release Date: April 1st, 2016 Glitterbeat Records www.glitterbeat.com Bamako-based producer/educator Paul Chandler has been documenting the sonic and cultural complexities of Malian traditional music for more than a decade and “Every Song Has Its End” is an out-of-time, visceral collection of sounds from Chandler’s unparalleled archive. Over the past few years, accompanied by a recording engineer and a video-maker, Chandler has ventured to off-the-grid villages and crossroad towns all across the vast Malian landscape. Through a network of long-nurtured local contacts this small team has sought out practicing traditional musicians and their under-documented and often endangered musics. Immersive and exhilarating, these field recordings and videos give us a privileged glimpse into the intricacies of the Malian musical experience. The tracks on “Every Song Has Its End” are in fact as varied as the land that they come from. The haunting modulations of the mostly female Group Ekanzam and the spiky, electrified drone of Super Onze were both recorded in Mali’s remote and embattled northeastern desert region. Conversely, the hypnotic, pulsing sounds of the Mianka Cultural Troupe’s elk horns (buru) and Ibrahim Traore’s warrior harp (bolon) have been recorded more than 1,500 kilometres away in Mali’s more verdant southern hill country. Some of the musicians are playing music that is tied to a specific traditional caste or village function. The declamatory “hunters” music of Sidiki Coulibaly and the “cultivator” balafon excursions of Kassoun Bagayoko are examples of this. And one track in particular, Sigui lé (It’s the Wild Buffalo) from the Nioguébougoula Cultural Troupe, seems to operate in a realm beyond mere music. The recording is a layered, 3D window into traditional village life, the “audience” and the “performers” interacting and fusing in a way that upends contemporary musical hierarchies. While it is ultimately impossible for us to fully grasp the cultural context and depth of the recordings on “Every Song Has Its End: Sonic Dispatches from Traditional Mali,” it also seems nearly impossible not to be hooked in by the mesmeric sound culture that they mirror. Without doubt, this is Malian music at its finest. got to get this on my play list - awesome!